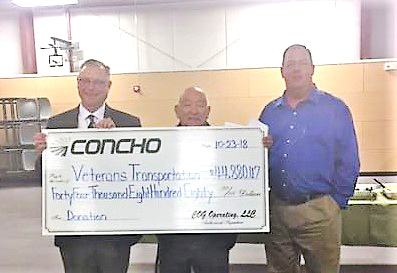 Concho Resources General Manager Paul Porter, left, and Concho senior staff electrical engineer Jack Callaway, right, present Magil Duran, center, president of the SENM Veterans Transportation Network, with a check in the amount of $44,880.47. The donated funds were raised through this year’s Concho Classic Clay Shoot, held annually in Artesia. The funds will assist the organization’s focus of supplying transportation for veterans to the Raymond G. Murphy VA Medical Center in Albuquerque.